Spray 4-quart Dutch oven with cooking spray; heat over medium-high heat. In Dutch oven, cook sausage about 2 minutes, stirring constantly, until brown. 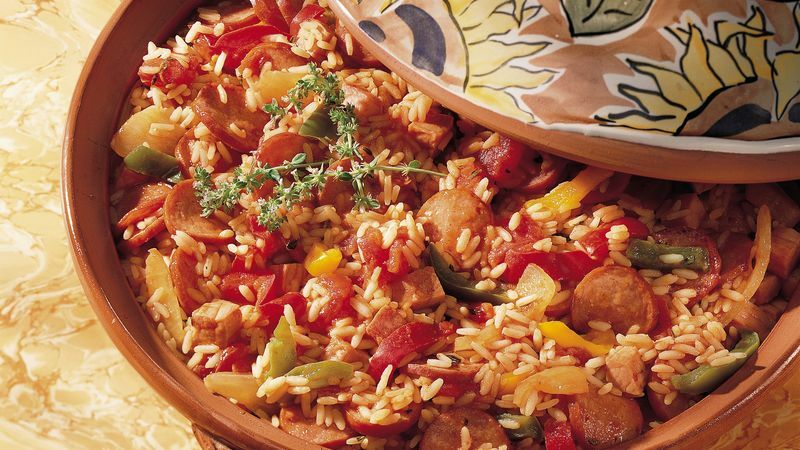 Remove sausage from Dutch oven; set aside. Stir in remaining ingredients except rice and pepper sauce. Heat to boiling. Stir in rice; return to boiling. Reduce heat; cover and simmer 20 minutes. Stir in sausage; heat until hot. Serve with pepper sauce. Stir in 1 package (4 ounces) frozen cooked salad shrimp, thawed, with the sausage in step 3 and heat through.